As you know, with the creation of our new Freshman Experience, Mrs. Breen Slauter, current Principal, will transition to Assistant Principal for The 9X Impact housed at Reynoldsburg High School’s Livingston Campus at the start of the 19-20 school year. We have used our time since her announcement to identify her replacement at Waggoner Road Junior High School. I am excited to announce that Dr. Twana Black will assume the role of your new Principal starting at the beginning of the 2019-20 school year. Dr. Black’s goal is to serve as the leader in an environment that fosters the preparation of students for a global society mirroring the District’s long-term initiatives. She is a multifaceted educator with more than 17 years of experience in diverse communities. She is adept in problem solving and building collaborative working environments. This passion served as the emphasis of her doctoral studies on teaming and team teaching. This research was driven by a desire to identity research strategies or initiatives emphasizing best practices that help to build a positive culture and climate around school teams or teaming relationships. “The opportunity to lead Waggoner Road Junior High School is a true honor and privilege. I am excited to meet and work with the exceptional students, staff, parents, community members, and the Reynoldsburg leadership,” said Dr. Black. Currently, Dr. Black serves the Lead Assistant Administrator at Pickerington High School Central in Pickerington, Ohio. Prior to her role there, she worked in the Columbus City School District and has experience at the collegiate level as an adjunct professor at Columbus State Community College, DeVry Community College, and more. and an Ed. D in Educational Policy and Leadership from the University of Phoenix. Dr. Black is married to Rev. Trevor L. Black. They have three children Taylor, Tylor, and Ty, ages 16, 14, and 11, respectively and a beautiful 6-month-old English bulldog named ‘Bubba’. She is an active volunteer in her church community and spiritedly involved with her sorority, Sigma Gamma Rho Sorority, Inc. In her spare time, she loves to travel, make jewelry, and use her Cricut for t-shirt making and a multitude of other projects. Please join me in welcoming Dr. Black to our District and to Waggoner Road Junior High School. I know she will empower our staff, be an advocate for our students, and be a change agent for the District. As you know, a team of administrators, teachers, staff and students have provided input and worked towards building an experience for all ninth graders for the 2019-20 school year. This experience, called The 9X Impact, will provide a robust high school transition anchored in tackling the challenges of the fiercely competitive and constantly changing 21st Century educational landscape. As a part of this process, we have been actively looking to fill positions for The 9X Impact. I am excited to announce that Mr. Christopher Brooks has been named The 9X Impact Leader effective January 1, 2019. Mr. Brooks will work directly in a high-performing environment that will be the nexus of reforming our high school educational experience and will have a direct impact on students in Reynoldsburg. He will advance the District’s Mission, engage in teaching and learning practices, create a positive school culture of support while inspiring students to be successful as they begin their high school careers. Mr. Brooks and The 9X Impact will be based at Reynoldsburg High School’s Livingston Campus. 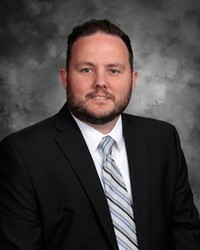 Currently, Mr. Brooks serves as the Principal of Waggoner Road Middle School, and previously, he oversaw the entire Waggoner Road Campus as the Lead Middle Level Principal. Mr. Brooks has been a member of Reynoldsburg City Schools’ staff since 2007. He has his Bachelor of Music in Music Education and Master of Education in Educational Administration from Bowling Green State University, in Bowling Green, Ohio, and is working towards a certificate in School Management and Leadership from Harvard University in Cambridge, Massachusetts. This also means that we will immediately begin the search process to identify Mr. Brooks’ successor as Principal at Waggoner Road Middle School. Please know that placing the best leader in this role is going to be a top priority for us and our students will not see any disruption to their school experiences. Please join me in welcoming Mr. Brooks to the future of Reynoldsburg High School and The 9X Impact! Please join me in welcoming Mr. Eric Cornett as the District’s Safety and Security Coordinator. Mr. Cornett will be based at our Business Office and report to Director of Business and Operations, Mr. Chris Reed. Mr. Cornett is a decorated military veteran and as former police officer, offers a strong portfolio in safety and security. He will be responsible for the implementation and management of security policies, planning, and procedures. He will also be accountable for the development, monitoring and coordination of security activities, District-wide emergency preparedness and safety training programs. Most recently, Mr. Cornett was a Reservist with the Air National Guard while concurrently acting as Deputy Sherriff for the Beaufort County Sherriff’s Office. He is skilled in developing investigative plans, reporting essential facts and conducting fact-finding interviews. He possesses knowledge of law enforcement standardized rules, procedures and operating techniques. Mr. Cornett is no stranger to the Buckeye State, as he is a retired Detective/Criminal Investigator for the City of Columbus’ Division of Public Safety, where he served for 24 years. He is also familiar with the inner workings of a School District as he was a Safety Resource Officer for Columbus City Schools. Mr. Cornett was honored with the Marine Corps Police Academy East Leadership Award and was Central Ohio Crime Stoppers Officer of the Year and Month in 2013. He has extensive training from the United States Air Force and the United States Marine Corps Police Academy. Please congratulate our newest Raider on his role, and welcome him to our community. I am writing to you today to provide an update on proposed staffing shifts within Central Office to provide additional support to our academic program and our administrative capacity. Please join me in welcoming Mrs. Kimberly Halley as our new Assistant Superintendent for the 2018-19 school year. Mrs. Halley will oversee District-wide discipline, enrollment, truancy, Title funding implementation, athletics, Support Staff Professional Learning, and other operational areas of the District, including our grades Pre-K-4 Principals. She will be a member of the Superintendent’s Cabinet and will report directly to me. With more than 26 years of experience as a public school educator, Mrs. Halley demonstrates collaborative and positive leadership through her strong commitment to students, families, staff and her community. She is an advocate for students and will help them meet their academic, social and emotional needs while looking at forward-thinking educational initiatives to advance learning opportunities. “I am honored to join Reynoldsburg City Schools as Assistant Superintendent. I look forward to partnering with the teachers, staff and families to serve all of our students,” said Mrs. Halley. “Together, we will continue to build upon the District's reputation of innovation." Prior to joining Reynoldsburg City Schools, Mrs. Halley was a Senior Consultant for School Improvement for the Educational Service Center of Central Ohio. She was the Chief Academic Officer for Hilliard City Schools and has experience as a Teacher, Assistant Principal and Principal within school districts within the state of Ohio. Mrs. Halley is in the process of earning her EdD from Miami University in Oxford, Ohio. She received her Master of Science Educational Administration from The University of Dayton in Dayton, Ohio and her Bachelor of Arts in Elementary Education from Capital University in Columbus, Ohio. Mrs. Halley is active in her community and serves as a volunteer as well as sits on several boards, including the United Way Board of Trustees Pickaway County and the Junior Achievement Board. She is a bible study leader and active in charities such as Miles for Melanoma, Parkinson’s Walk for a Cure and Relay for Life. I am excited to welcome Mrs. Halley to Reynoldsburg, please join me in congratulating her. I look forward to working with her to become a change agent for the District. 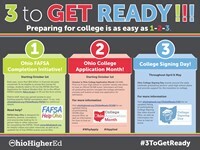 We are taking part in the Ohio Department of Higher Educations' “3 To Get Ready” initiative and we would like to invite parents and high school students to a couple of events to help them prepare for college. The "3 to Get Ready" campaign focuses on applying for financial aid, submitting college applications and more. The dates and times correspond to parent/teacher conferences already scheduled. Our counselors have organized the event and we will have reps from OSU and Capital on hand at both events. Raiders Prep for First Home Game! On Friday, our Reynoldsburg Raiders play their opening home football game. It is an exciting time for our District, our players and our community. Showing our Raider Pride and supporting our young athletes is extremely important for all of us. It is our top priority to ensure that we do so in a family-friendly, inviting, and safe environment. Two years ago, we began enforcing a no-bag policy and utilized crowd control barriers under the stands. These efforts will remain in effect this year. The no-bag policy is limited to those of school age only (18 years old and younger). The duty to prove age will rest on the ticketholder. Furthermore, we will continue to deploy crowd control measures under the stands to encourage free movement, reduce congestion, and enhance safety. Spectators are asked to remain seated in the stands during the game. Loitering or gathering in the aisles, concourses, ramps, entrances or exits is prohibited. Smoking, including the use of electronic cigarettes or other intoxicants, or possession of alcohol are not permitted. There will be no roughhousing, running, fighting, use of profanity, or acting in a manner considered to be: offensive, threatening, insulting, humiliating, embarrassing, disruptive, obscene, sexually explicit, gang related, or violent. Any violation of the student code of conduct or the creation of an unsafe environment or condition will be grounds for removal from the game without ticket reimbursement. We are hoping that with your help, it will not be necessary to implement additional measures. Together, we will create a positive image for visiting fans and a safe environment for students, staff, and community members. Please assist us by speaking to your child(ren) about appropriate and acceptable behavior while attending school sponsored events and remind them that no bags will be permitted in the stadium. Thank you for your understanding and continued support. Go Raiders! In a letter from State Superintendent Paolo DeMaria, Reynoldsburg City Schools was selected for the Striving Readers Comprehensive Literacy subgrant. The subgrant will increase the District’s capacity to provide high-quality literacy programming not only during the grant period of 2018-2020 but far beyond the grant period. As a result of this grant, Reynoldsburg City Schools will implement researched-based strategies to achieve a common vision and goal for literacy. More than $33 million was awarded today by the Ohio Department of Education to 46 school districts to improve the language and literacy development of our state’s children. The grant was awarded following a competitive peer review process and will be divided among elementary, middle and high school levels to raise literary achievement within the District. Click here to read a PDF of the Press Release. REYNOLDSBURG, Ohio – During the April Regular Board of Education Meeting, Reynoldsburg City Schools Superintendent Melvin J. Brown and the Reynoldsburg Board of Education announced Dr. Tanya Davis as the District’s new Director of Human Resources. Reporting to Brown, Davis is responsible for the overall delivery of the HR function within the District as well as leadership and vision for the Human Resources Department. Davis will create and implement a long-term HR strategy that align with the District’s overall goals and objectives. She will also provide leadership to support administrative, instructional and non-instructional staff within Reynoldsburg City Schools. “I am thrilled to join the Reynoldsburg City School District and to become a member of this great community. I look forward to working with Mr. Brown and staff to advance the District’s mission and vision,” said Davis. Most Recently, Davis was the Assistant Director of Urban Support with the Ohio Department of Education, specifically within the Office for Exceptional Children. She provided guidance and technical assistance to large urban school districts within the state of Ohio regarding the proper implementation of Federal and State rules and regulations and various issues related to the delivery of special education services. Davis has more than 15 years’ experience within the education and human resource sectors. Originally from Cincinnati, Davis earned her bachelor’s degree from the University of Cincinnati and her master’s degree from Miami University in Oxford, Ohio. She received her Ph.D. in Communication Sciences and Disorders from the University of Cincinnati, and holds 5-year Professional Administrative Specialist License. Davis lives in Cincinnati with her puppy Louis and two sons Antonio and Zairn, who attend Wittenberg University and Urbana University respectively. She plans to relocate to the Reynoldsburg area in the summer of 2019. We are pleased to announce that after examining several options and looking at space requirements, we are able to offer all rising 9th grade students their first choice of Academies provided they submitted their card by the deadline of February 2, 2018 for the 2018-19 school year. For rising 9th grade students who submitted their cards after the February 2 deadline, they will be assigned to their second choice Academy at the opposite campus, space permitting. We continue to pursue the concept of a “Freshman Experience” for the 2019-20 school year and beyond, which will address many issues and to improve our overall District culture while creating a system whereby all students receive a firm level of foundational skills increasing their grit, academic strength, and endurance with the support of a group of adults who will know them well. We will also be very cognizant of the needs of next year’s freshman class and the impact of transitions on their experiences. In the process of creating plans for 2019-20, we will also have a keen focus on ensuring that 9th graders in 2018-19 will be given the resources that they need to be successful including, but not limited to, course offerings, program exposure, and preparation for advanced coursework. 614-501-1033. As always, we thank you for your support and cooperation. Click here to view the Academy Transformation Proposal Presentation. Superintendent Melvin J. Brown presented to the Reynoldsburg City Chamber of Commerce on the State of the Schools. Click the image below to view the presentation. Click to review Mr. Brown's presentation during Winter Academy.